I need to sit over this post the way you carefully observed Monet’s work. I love his work. I think of my own as a sort of doodle. You know how some people doodle on a notepad? I sit at my computer or my journal and write words or lines or characters’ names—letting them pour out on the page. I don’t always know what will take shape from my doodling. But it’s nice to build up the habit again. For a long time, I didn’t give myself permission to doodle. I thought everything had to come out perfect—a paralyzing notion. Kind of like expecting a fully realized “Monet” to appear the moment one puts paintbrush to canvas. Ridiculous, isn’t it? I love this: “the confidence to creatively interpret.” We have a vision in our heads, but once attempt to pin it down (or put pen to it), we sometimes lose confidence in our ability to interpret. I guess that’s where the habit of doodling—creating those smudges that will one day mean something—comes in handy. Thanks for your comment, Linda. I couldn’t agree more: we need to give ourselves permission to doodle, and doodle badly. I’ve noticed that, on revision, it’s harder to delete those overwrought sentences. And writing is all about deleting. Thanks for your comment, Shawna. The idea of moving is very appealing to me. We engage with our stories and characters on the sentence level, but we also need to climb trees for a different view, then mountains, or space ships. There are so many parallels between visual art and the written word. Every stroke is intentional whether it appears to be or not–and the same goes for writing. 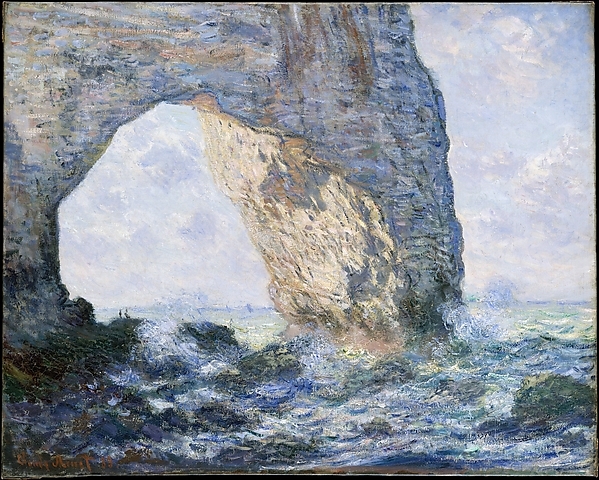 Sometimes you need to step back in order to see a piece, just as Monet would do in his studio. Sometimes you need to adjust, maneuver, and rethink the fundamentals before you can grasp a theme. Sometimes you just need to erase everything and start over. Thanks for your comment, Meg (and the wonderful day at the Met). The more I learn about visual art the more similarities I see with writing but—whoa—I have a lot to learn about both. What a lovely post, Laura! Your descriptions of Monet’s forward-and-backward movement and your son’s training process made me think of writing advice I’ve heard before: that it’s extremely difficult to embrace the creative flow and playfully experiment at the same time that you’re applying that “sharp eye” and worrying about things like structure and timeline, so it often works well to focus on one and then the other. Thanks for this thought-provoking piece! Laurie, thanks for your comment. The more I write the more I see components of the writing process clash with each other. We’re told to learn the rules, then not to worry about them and just write from our heart. We’re told to learn structure and plot, but to pay attention to our characters first and foremost. We should write with authenticity but only so far as the values we write don’t misrepresent the core message of whatever culture we write about. I could go on and on….so I love your message of taking it one step at a time. Thanks for sharing. It always feels like I’ve used every component until my work is critiqued. Then, revisiting the components and the revision process starts, hopefully moving my writing closer to what I was trying o create. Great Post. Monet is one of my favorites. His cathedral paintings in the snow are as good as it gets. Though Monet is amazing at this, Rembrandt to me is the master. I can spend hours in the Rembrandt room at the Met. Just as an insight it is not just walking back and forth. It is also the size of the brushes. With the right tools you can eliminate a lot of the leg work. Rembrandt used very long brushes, allowing him to almost stand back and paint at the same time. Yes it is all about perspective. It is what the majority of struggle with on a daily basis. Seeing beyond is a gift, that can be learned with much practice. I’m still practicing.